Today's another installation of my dream house series. If I could plan my absolute dream home, what would it look like? One thing is for sure, I'd have a cozy keeping room nook located right off of our kitchen. It doesn't have to be a big space- just a little space with enough room for a couple of overstuffed armchairs and a fireplace. 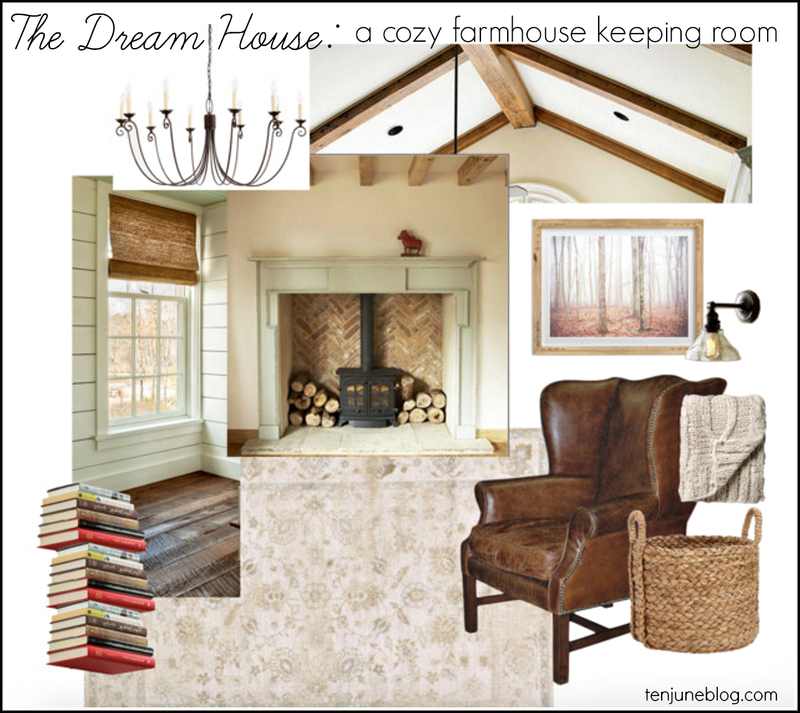 And while we're dreaming, how about vaulted ceilings with rustic exposed wooden beams? Yes, please! My goals for this room would be to create a warm, cozy space that I could curl up in to do my morning Bible readings or a place the kids could later work on some homework while I'm cooking dinner. A nice, quiet place of relaxation. With that said, I think I'd focus less on color and more on textures in the space- a neutral palette with the introduction of a soft wool rug, white shiplap walls, rustic wooden beams, leather furniture and a brick herringbone fireplace. I think I could spend some nice, cozy time in there, don't you?! I realized when I was making this board that I don't really have any go-to sources for quality vintage-looking leather furniture. Do you have any recommendations? Do share! Or follow me on Pinterest for more inspiration!